1. To reduces interferences of internal traffic movements and to unload raw material. 2. Blending by making homogenous pile of raw material. 3. Keeping buffer stock of raw material and their uninterrupted supply. Iron ore fines to SP2 & SP3. Iron ore to blast furnace. Low silicon limestone to RMP2 & SMS2. High silicon dolomite to SP2, SP3 & SMS2. Ø Coke (fuel), Iron Ore, Sinter (Fe-bearing material), Limestone (Flux) & Mn-Ore and Quartzite (additives). Ø Blast Furnace is a vertical shaft furnace, enclose in a welded shell, lined with fire-clay bricks of high alumina content. Cold blast CB Main Stoves HB Main Bustle pipe Gooseneck pipe Tuyer stock Furnace. Ø The furnace is provided with a tap hole, which is enclosed in a steel cast frame and is cooled by two Tap hole coolers, which have their own supply of water. 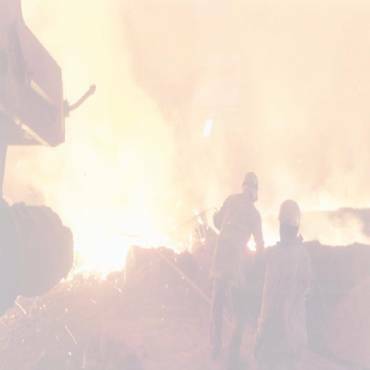 Ø The hot metal is tapped out at an interval of 1-2 hrs depending upon the furnace condition. Ø The usual way of opening the tap hole is to drill the tap hole until the skull is reached. Oxygen lancing is carried out melt the skull. Ø The hot metal continues to flow down the bend runner form, which it is diverted into individual metal ladles.